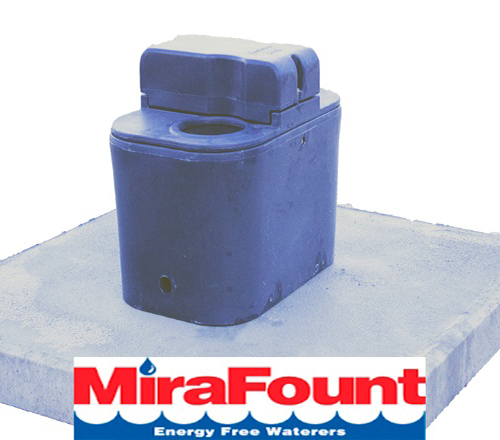 Stewart Concrete offers a variety of livestock watering options: Including our popular freeze-proof models, various concrete tanks, and we also carry an extensive line of Mirafount Polyethylene waterers. Whatever type of livestock watering project you are planning, Stewart Concrete can provide you with the best solution. Whether you are building a pond, feed lot, or an intensive grazing operation, our knowledgeable representatives are available to assist you in making the best choice for your application. Click on any link to download drawings and specs, or to watch our Ice Preventer video. Our freeze-proof concrete waterers are the best in the industry. With both a single-sided and double-sided option, these waterers can be used to meet a wide range of livestock watering needs. Our high quality products may be used on ponds, rural water, or individual wells. With over forty years of proven reliability, our waterers continue to give our customers years of trouble-free service. Equipped with energy free automatic ice prevention system: The fully adjustable thermostat will automatically be activated in extremely cold conditions, discouraging freezing, without electricity. Uses less water: The thermostat automatically switches the over flow valve on and off, which greatly reduces the amount of water used compared to the manual ice prevention systems. Great for rotational grazing projects: When placed in a fence row, the double waterer will provide water to two separate pastures. NOTE: Stewart Concrete freeze-proof waterers qualify for most state and county conservation projects. Contact your local soil and water conservation district office for potential cost share programs available. Stewart Concrete has various sizes of open top concrete tanks available for spring development or pressurized watering systems. These tanks have PVC fittings cast in the concrete to accommodate the inlet supply and drain. Various types of valves and ice prevention may be installed for your specific application. Contact us to discuss the best option for your project. Stewart Concrete is an authorized MiraFount dealer. We stock several different styles of ball-type energy free and open top waterers. Contact us for a complete list of waterers available. We also stock 6’ x 6’ concrete pads which are used as a platform for the poly waterers, as seen in the picture. These pads are 6” thick and have a preformed 15” or 18” hole to accommodate the required heat well.